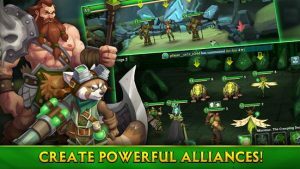 Alliance Heroes of the Spire : Collect and upgrade a team of powerful heroes as you explore the latest action packed RPG, Alliance: Heroes of the Spire. Gather your allies, challenge fearsome enemies, and compete for legendary items. Explore countless Rifts and claim your glory! I used to play a ton of summoner’s war and now I am playing this non-stop. Some great monster ideas and challenging content. A lot of improvements too to lessen the grind. If you liked SW, you will love it! Grandmaster 1 will now be introduced with a 750 Trophy requirement to enter. Players that reach Grandmaster 1 will be reset back down to Grandmaster 1 at 750 Trophies at the start of each Arena season. Master 3 requirements have been increased to 675 Trophies. Bounty Blade turn-in rewards now have a chance to grant different currencies other than gold.